July 4th – The German Oration Sun. 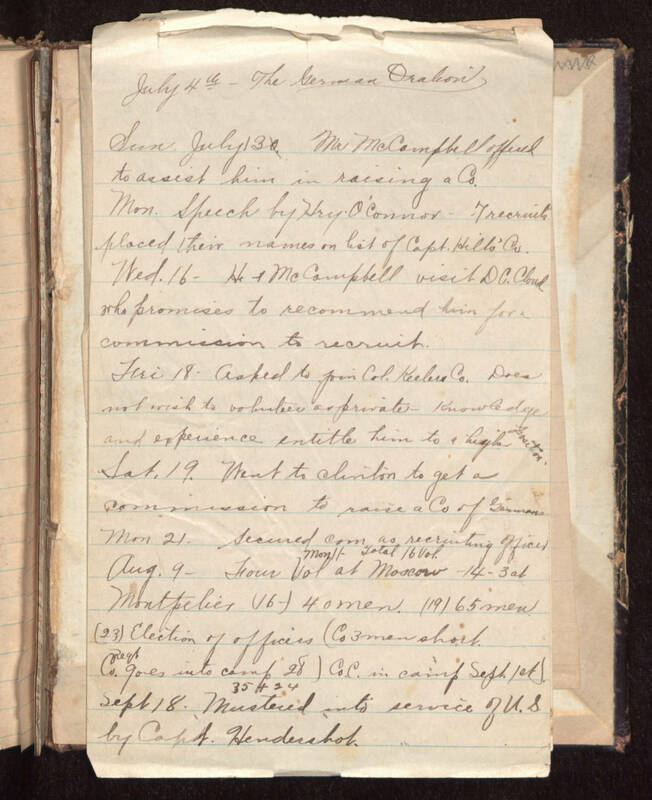 July 13 Mr McCampbell offered to assist him in raising a Co. Mon. Speech by Hry. O’Connor – 7 recruits placed their names on list of Capt. Hill’s Co. Wed. 16 He & McCampbell visit D. C. Cloud who promises to recommend him for commission to recruit. Fri. 18 Asked to join Col. Keelers Co. Does not wish to volunteer as private - Knowledge and experience entitle him to a high position. Sat. 19. Went to Clinton to get a commission to raise a Co. of Germans Mon 21 Secured com as recruiting officer Aug. 9 Four Vol at Moscow Mon 11 Total 16 Vol. 14 – 3 at Montpelier (16) 40 men. (19) 65 men (23) Election of officers (Co 3 men short Regt Co. goes into camp 28) Co. C. in camp Sept 1st Sept 18. 35 + 24 Mustered into service of U. S. by Capt Hendershot.